The top three players operating in the market hold a share of around 56%, as per Transparency Market Research (TMR). The names of these prominent players are Danaher Corporation, Institut Straumann AG, and DENTSPLY International, Inc. This market is characterized by constant product enhancements. The market, at present, is highly competitive, as huge count of companies plan on capitalizing on the development of this market. The global dental consumables market is predicted to touch US$27,589.6 mn in 2023, expanding at a 5.70% CAGR between 2015 and 2023. In the market for dental implants, the segment of titanium dental implants held the most dominant share. The segment of zirconium dental implants do not comprise metals and the biotechnical characteristics of these implants permit the manufacturing of a biocompatible tooth. The segment of crowns and bridges will experience the highest demand in the coming years in comparison to all other products in the dental consumables market. In the market for crowns and bridges, ceramic crowns have been gaining popularity owing to the fact that individuals are more inclined toward aesthetic appeal and oral hygiene. The segment of ceramic crowns is predicted to rise at a CAGR of 9.20% from 2015 to 2023. The growing awareness regarding dental care and the soaring demand for cosmetic and preventive dentistry are the main factors fuelling the growth of the segment of dental crowns and bridges, while the demand for the segment of endodontic files is led by the increasing demand from baby boomers and enhancement in the technology utilized. On the basis of geography, the Europe dental consumable market held a dominant share of 40.7% in the market in 2014, and was trailed by North America constituting a share of 33.7% in the same year. The high funding in nations such as Norway, Greece, Spain, and the UK for oral healthcare facilities will boost the development of the dental consumables market in Europe. In North America, the U.S constituted a share of 82.2% in the market in 2014. On the other hand, Asia Pacific is predicted to emerge as the most swiftly developing dental consumables market and will expand at a 6.0% CAGR between 2015 and 2023. 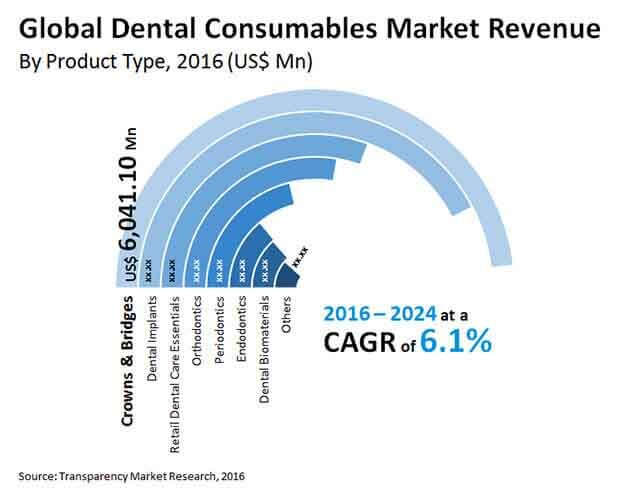 The global dental consumables market is expected to grow due to the constant developments seen in dental implant techniques, states a TMR analyst. The dental tourism industry is on the rise owing to fixed cost and low labor coupled with low government intervention in emerging nations. Hence, the growing dental tourism will also bode well for the development of this market. In addition, the growing requirement for painless procedures and aging trends globally will bode well for the development of this market. Individuals aged 65 and above undergo more dental treatments such as periodontal surgeries and implants as compared to the younger population. This way the increasing aging population will expand the patient pool in dentistry, thus providing impetus to the overall dental consumables market. “The huge unmet medical requirements globally and the soaring disposable incomes of individuals residing in developing nations will also positively impact the growth of the market for dental consumables,” says a TMR analyst. On the other hand, a number of allergies that may take place as an after effect of dental implants and the absence of supportive reimbursement policies in some of the nations may work against the development of this market.